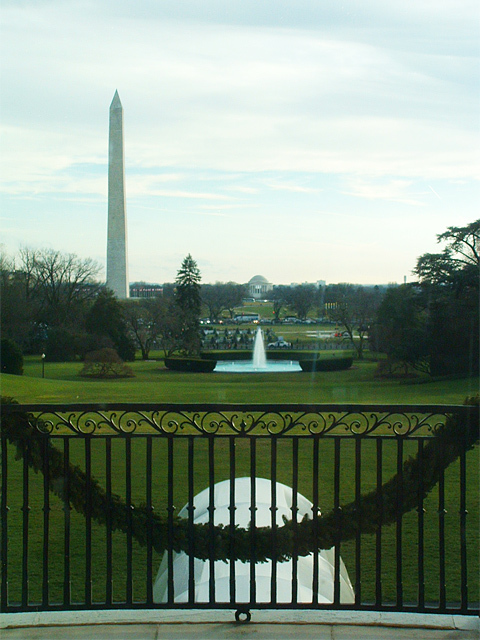 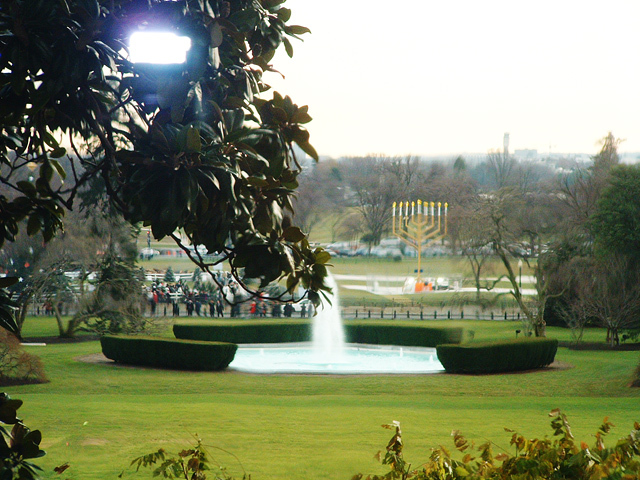 Eye on Washington's President, Janet Kopenhaver, was honored with an invitation to a White House holiday party on December 14, 2009. 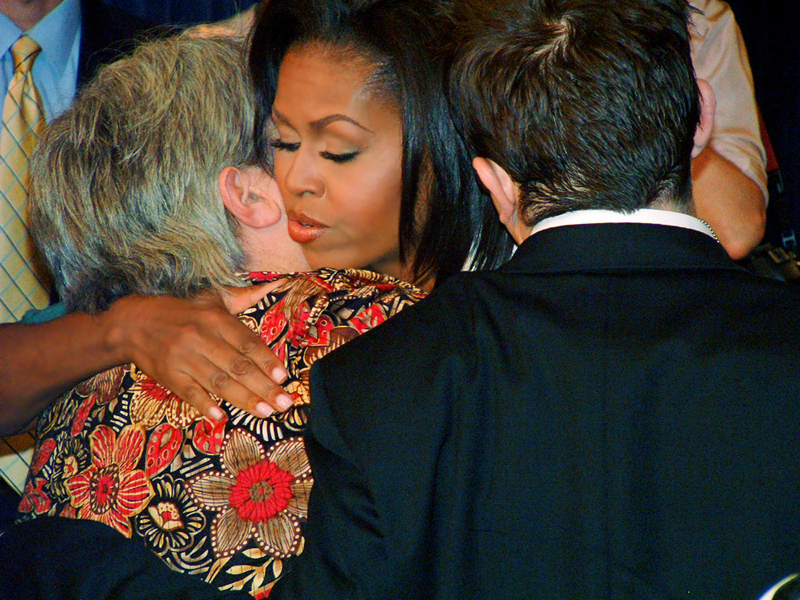 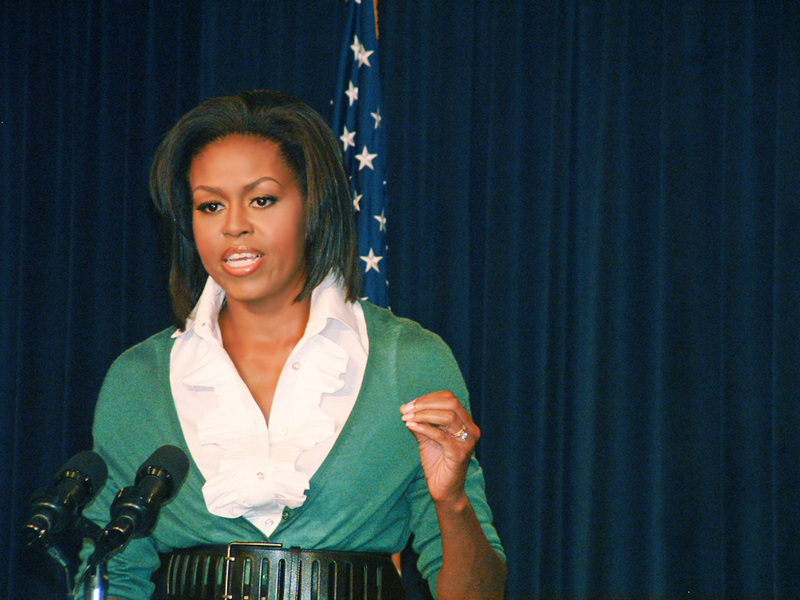 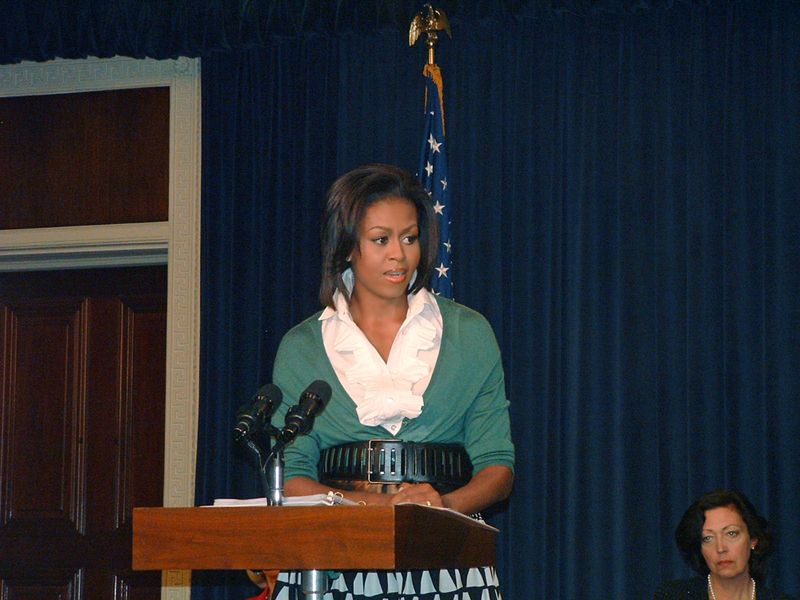 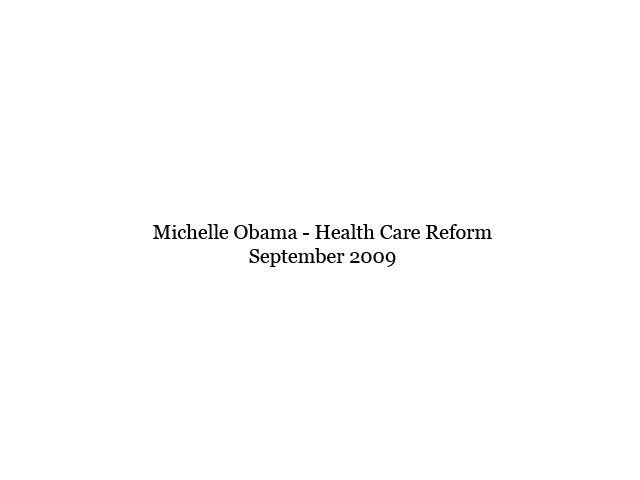 President and Mrs. Obama greeted guests and made brief remarks. 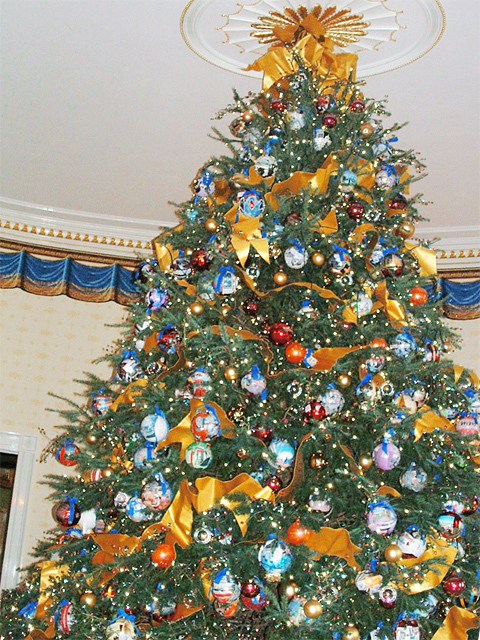 The White House decorations were simply fabulous. 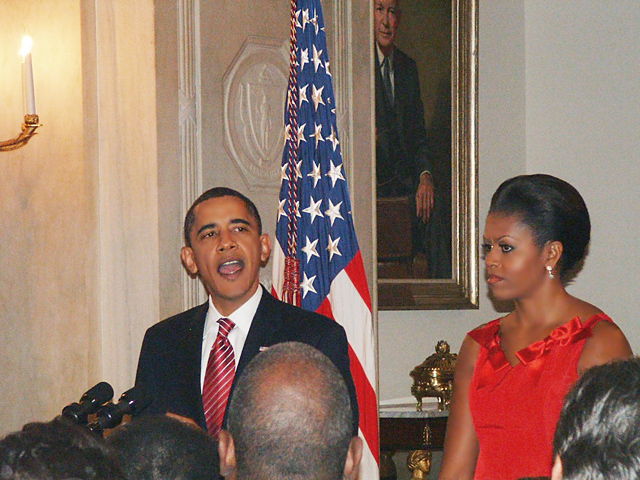 The President and Mrs. Obama greet guests. 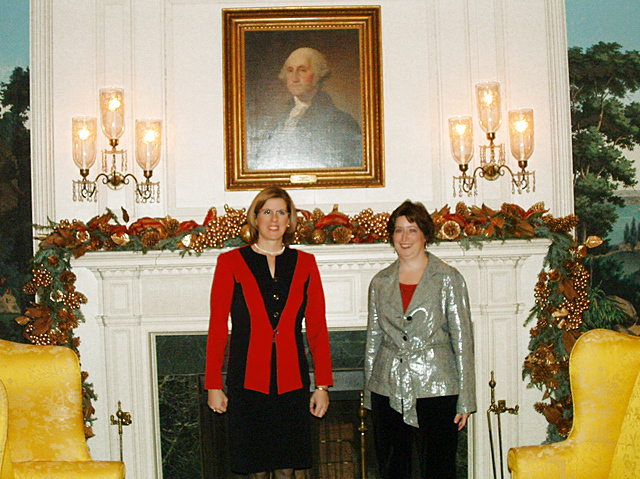 Janet Kopenhaver and Cheryl Glang from the National Military Association visit the White House Diplomatic Room. 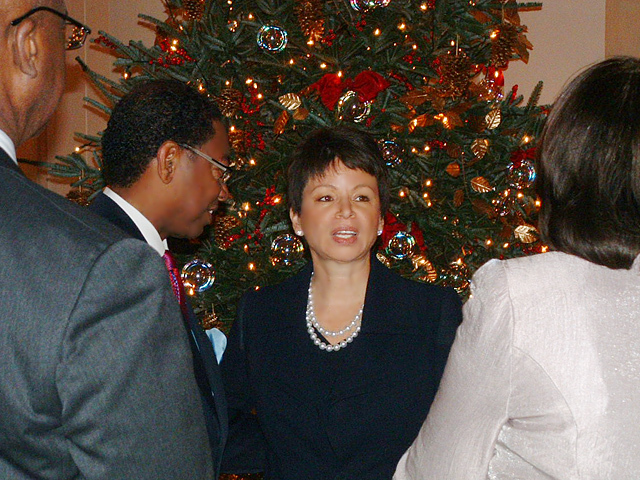 Janet Kopenhaver met and discussed women�s issues with Senior Advisor to the President, Valerie Jarrett (center). 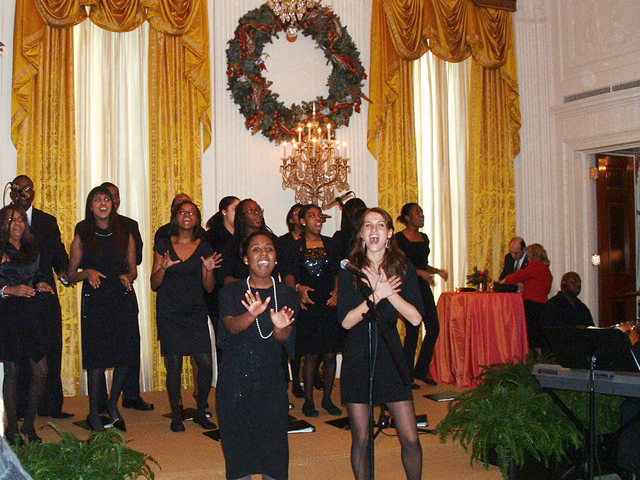 Guests are entertained by a choir from a local DC school. 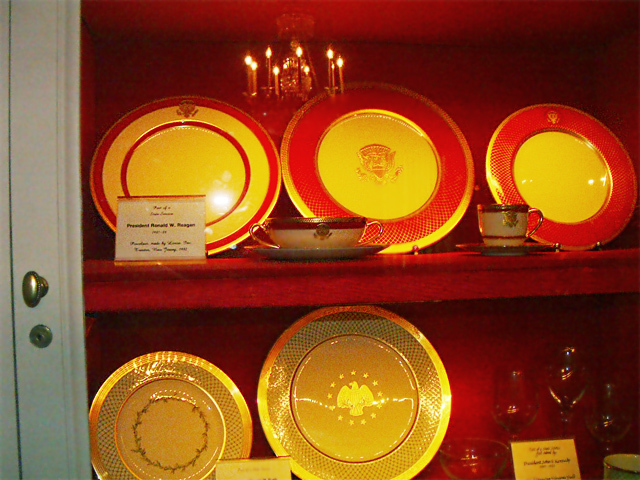 White House china from the china room. 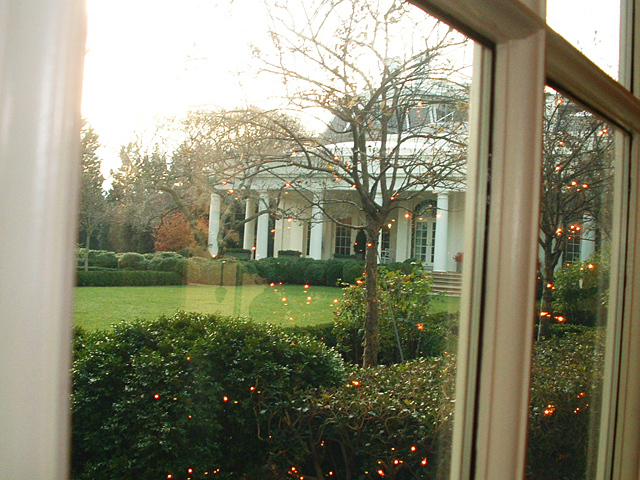 Guests were entertained by a pianist in the Entrance Hall. 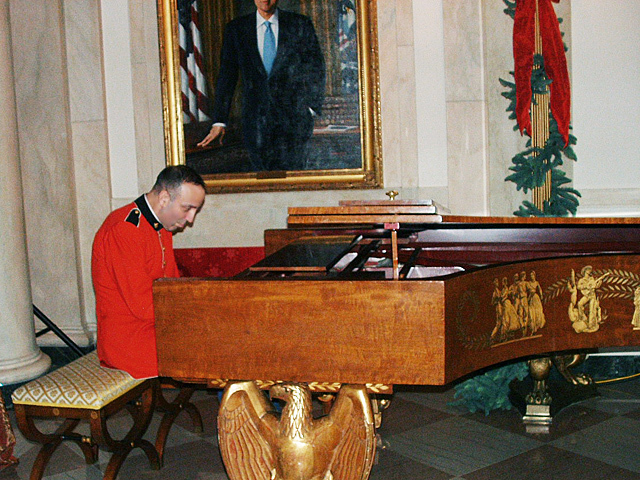 Shown here is the most famous piano in the White House - the Steinway grand piano with gilt American eagle supports. 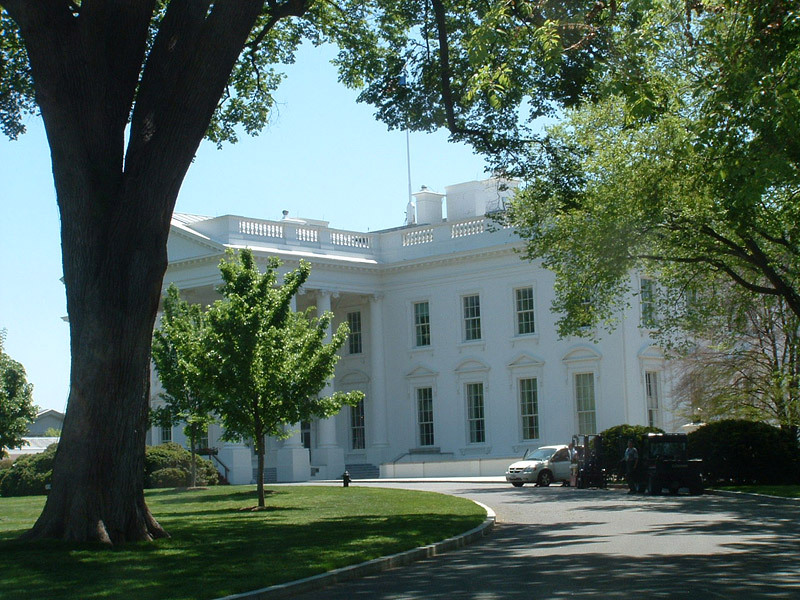 It was designed by Eric Gugler (with help from Franklin Roosevelt) and was given to the White House in 1938 by the manufacturer. 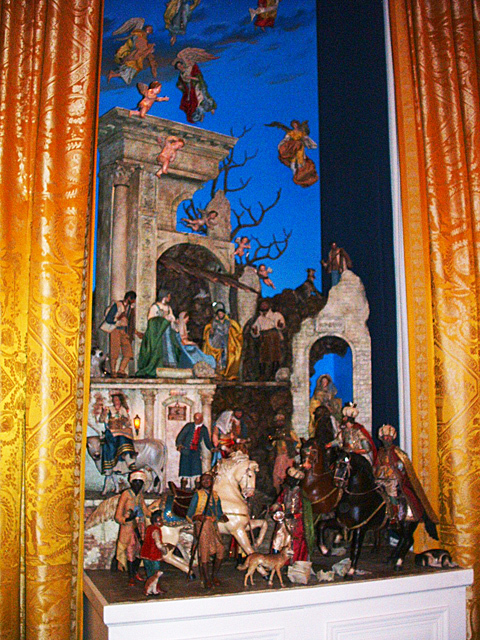 It is decorated with gilt stenciling by Dunbar Beck. 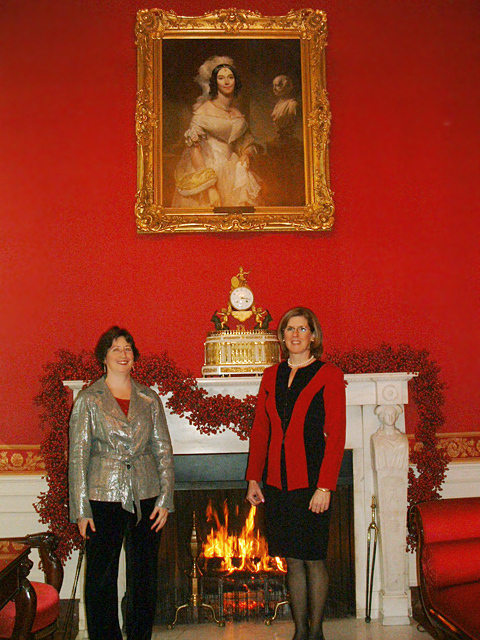 Janet Kopenhaver and Cheryl Glang enjoy the roaring fire in the Red Room. 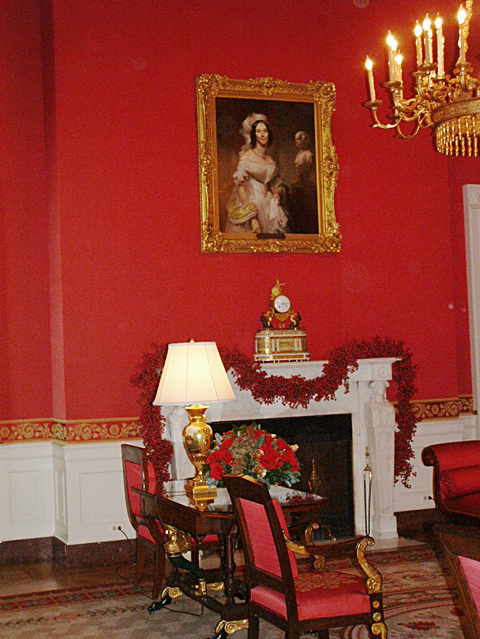 The lovely Red Room in the East Wing. 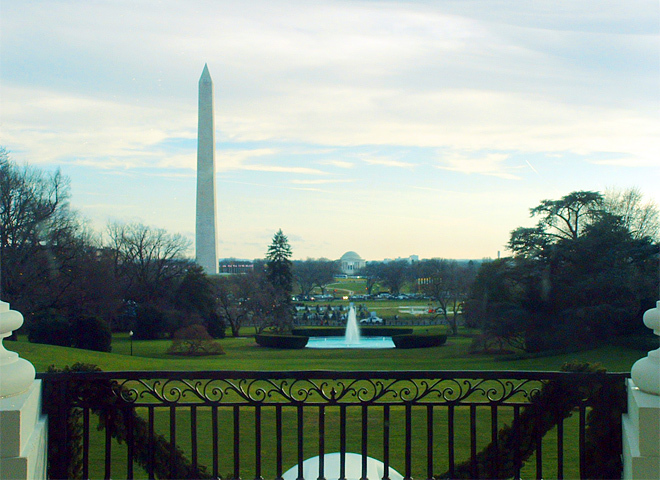 The staircase to the official residence for the President�s family as seen from the Entrance Hall. 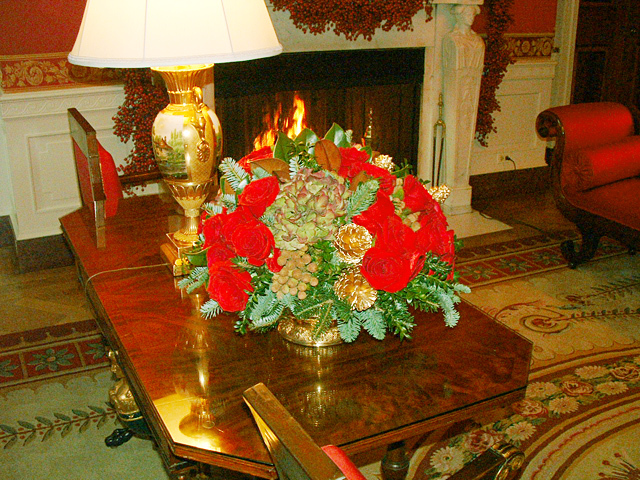 Sample of the White House Christmas flower decorations in the Red Room. 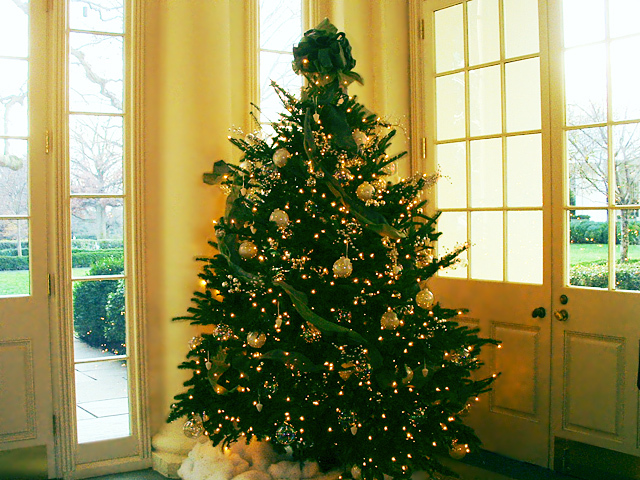 Tree in the East Wing patio outside the official White House residence. 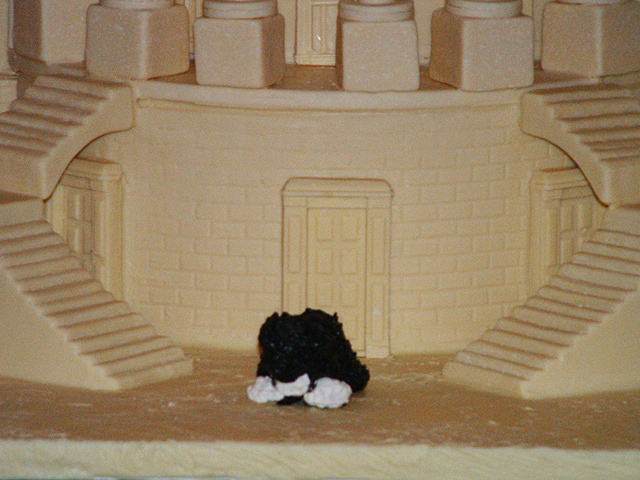 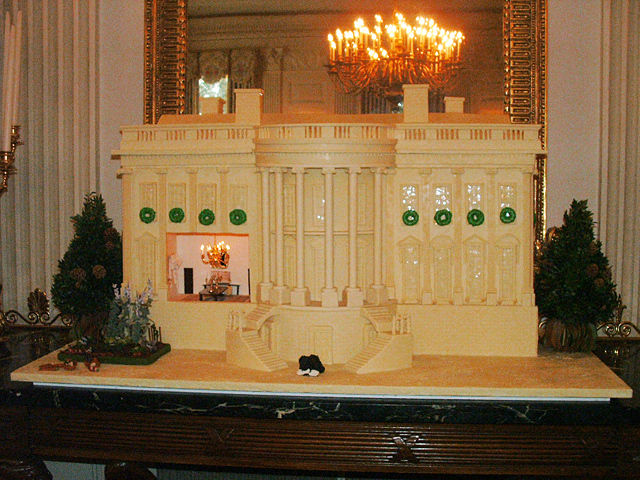 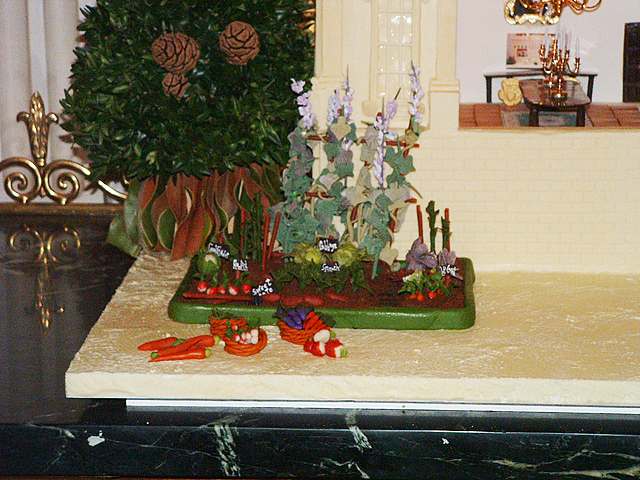 One of the most famous decorations in the White House each year is the gingerbread house depicting the White House. 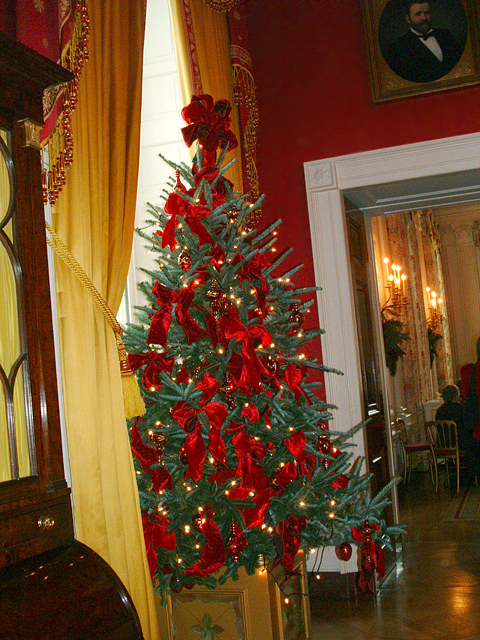 The decorated tree in the Blue Room. 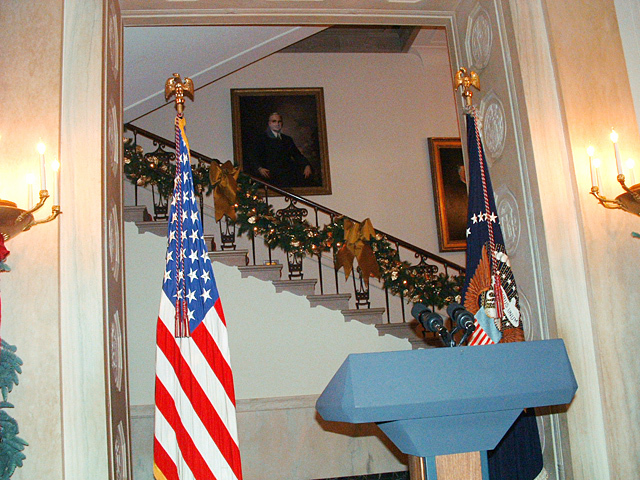 Wall sculpture in the State Dining Room. 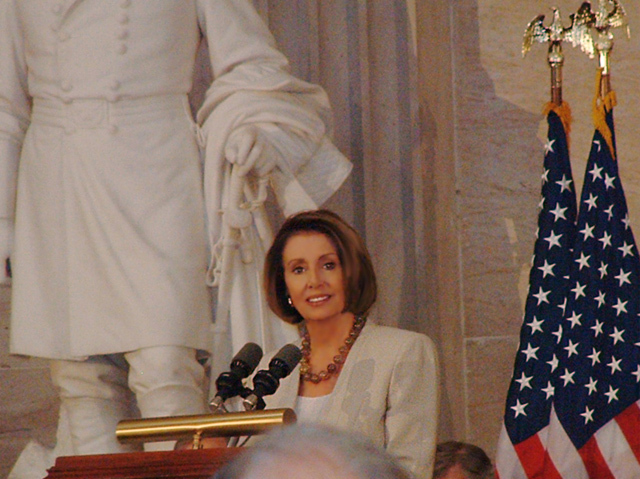 Janet Kopenhaver, President of Eye on Washington, was invited by House Speaker Nancy Pelosi (D-CA) to attend the formal unveiling of a statue dedicated to Helen Keller for display in the Capitol. 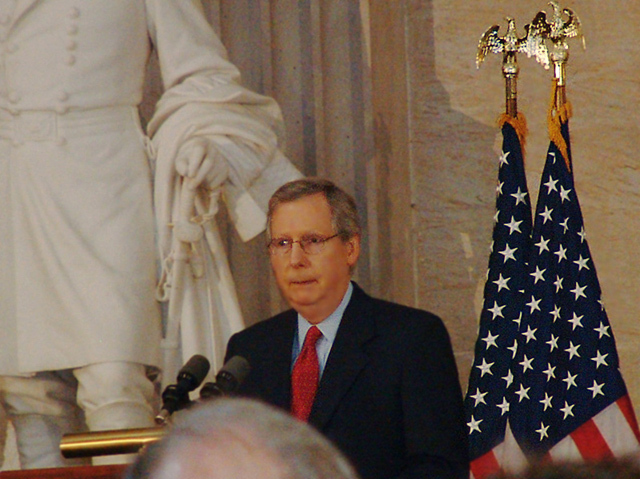 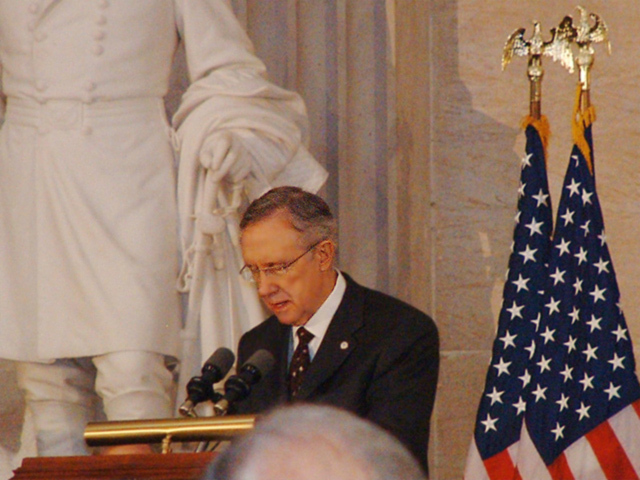 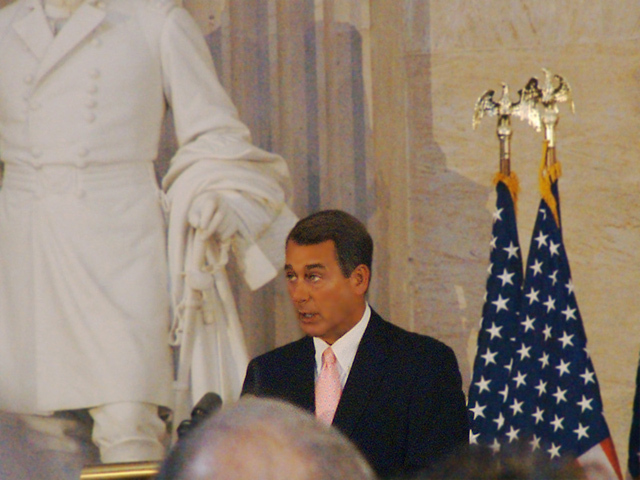 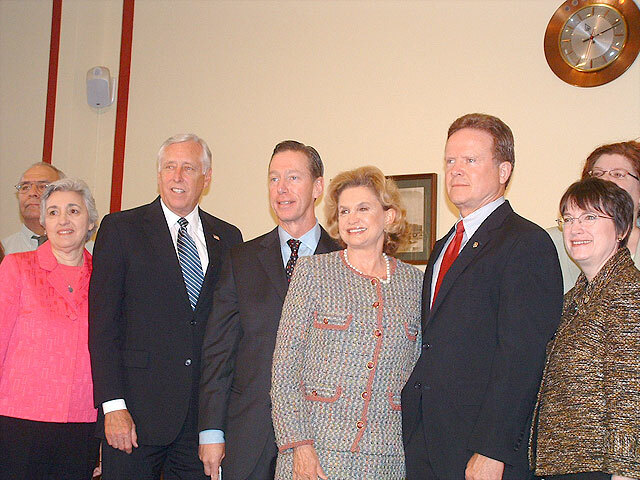 Congressional leaders were all present to make remarks. 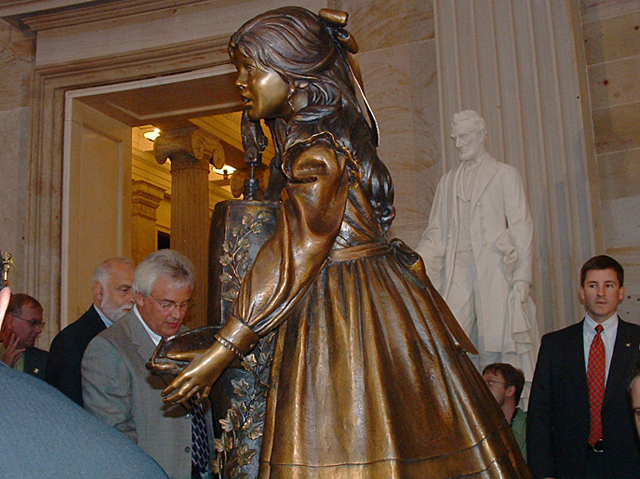 The formal unveiling of the statue. 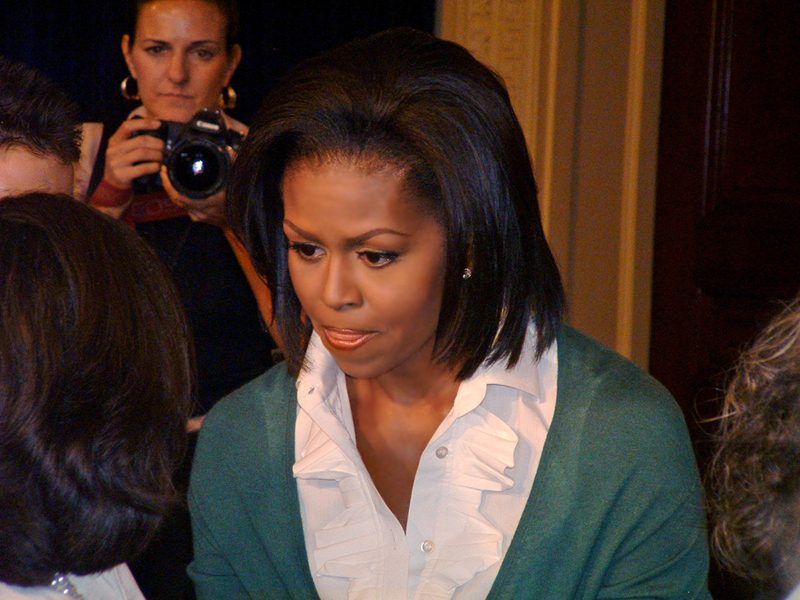 Eye on Washington President, Janet Kopenhaver, was among a small group invited to hear First Lady Michelle Obama discuss the importance of health care reform. 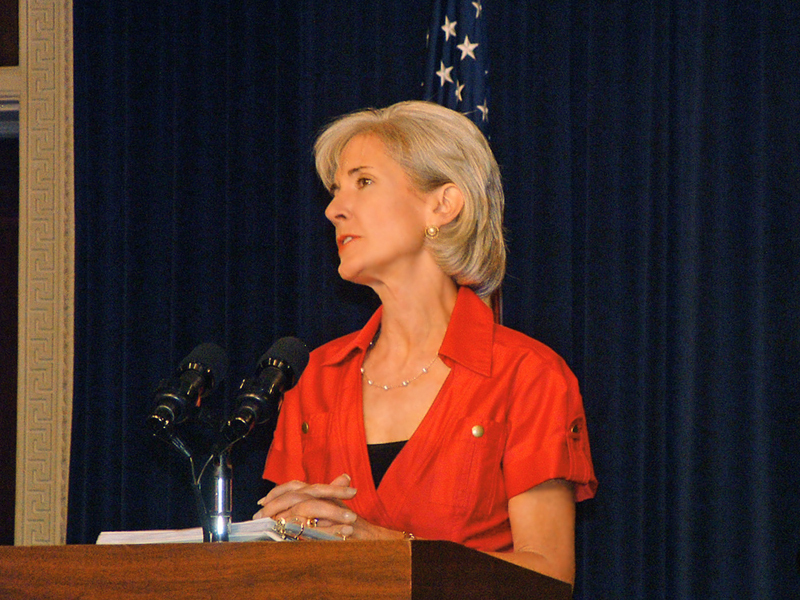 Also making presentations were Health and Human Services Secretary, Kathleen Sebelius and White House Council on Women and Girls Executive Director, Tina Tchen. 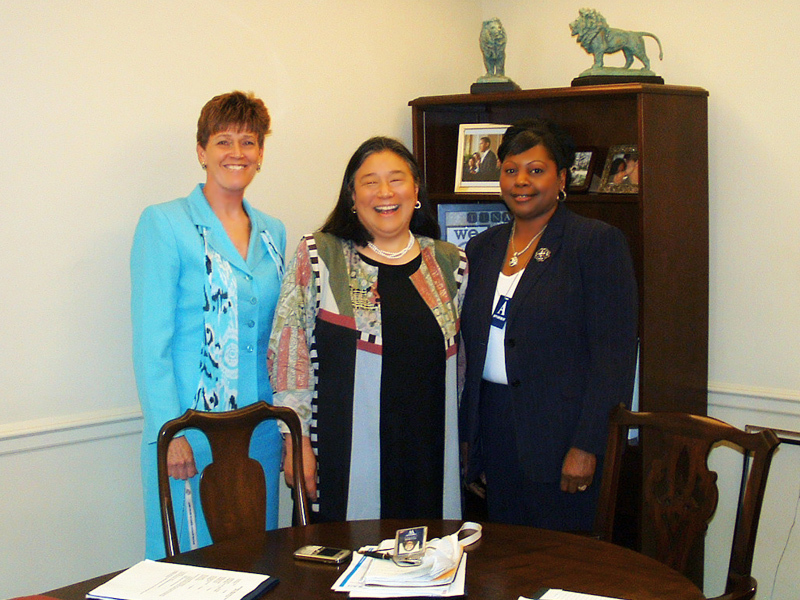 At a meeting arranged by Eye on Washington for its a client, leaders of the organization met with Ms. Tina Tchen, Executive Director of the White House Council on Women and Girls. 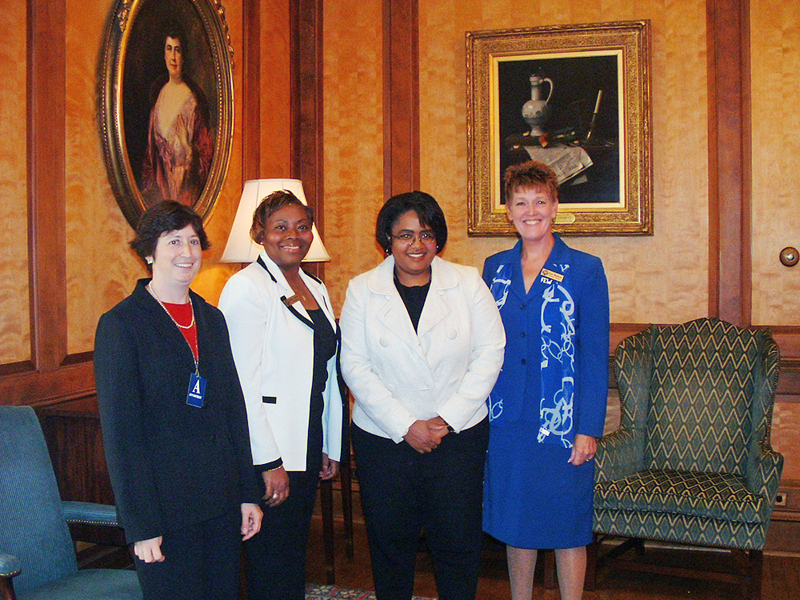 Eye on Washington President Janet Kopenhaver and clients meet with First Lady Michelle Obama's Senior Domestic Policy Advisor, Jocelyn Frye. 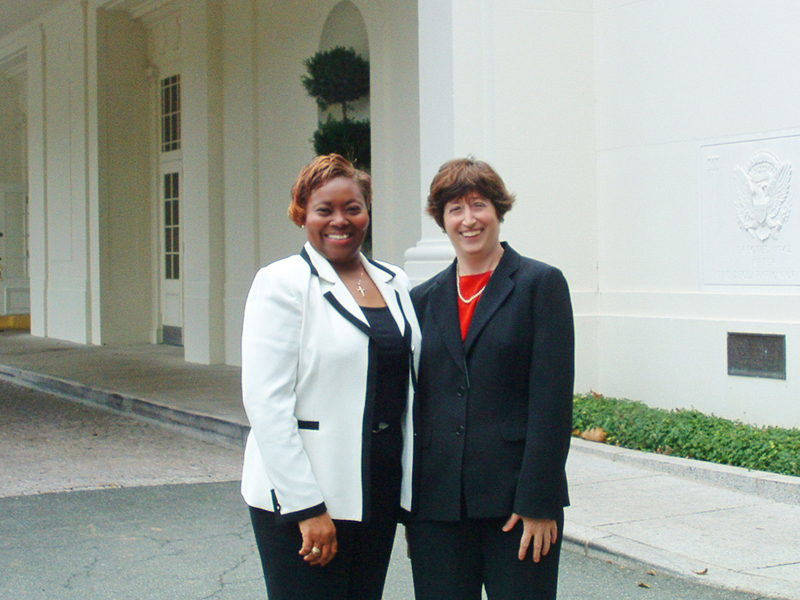 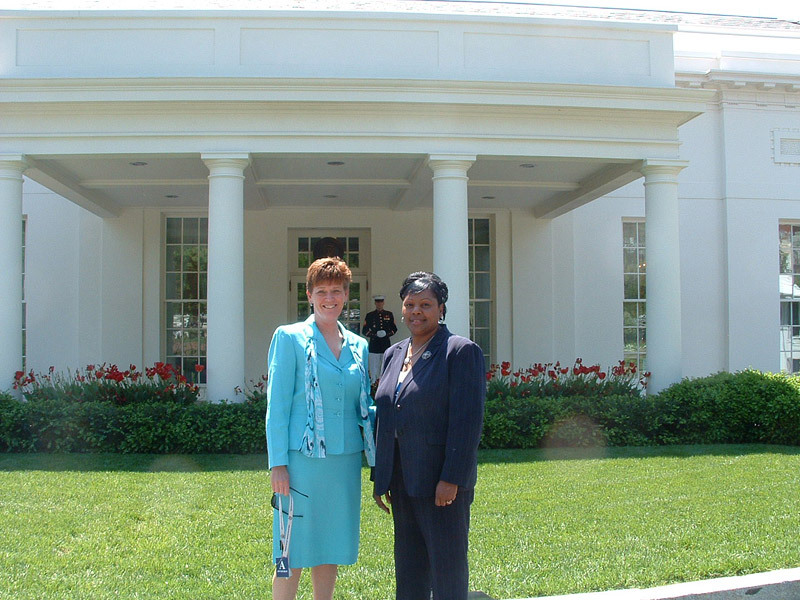 Janet Kopenhaver pauses outside the East Wing with a client Vice President for Congressional Relations, Cecelia Davis. 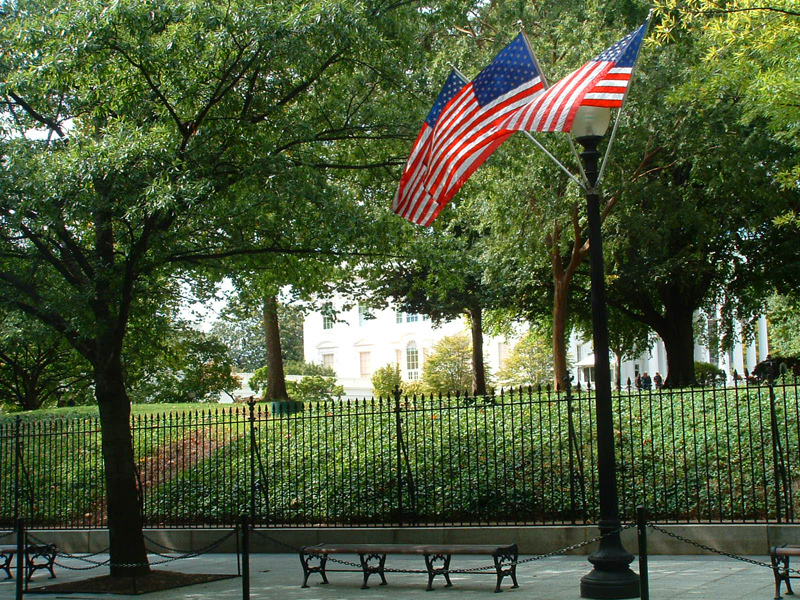 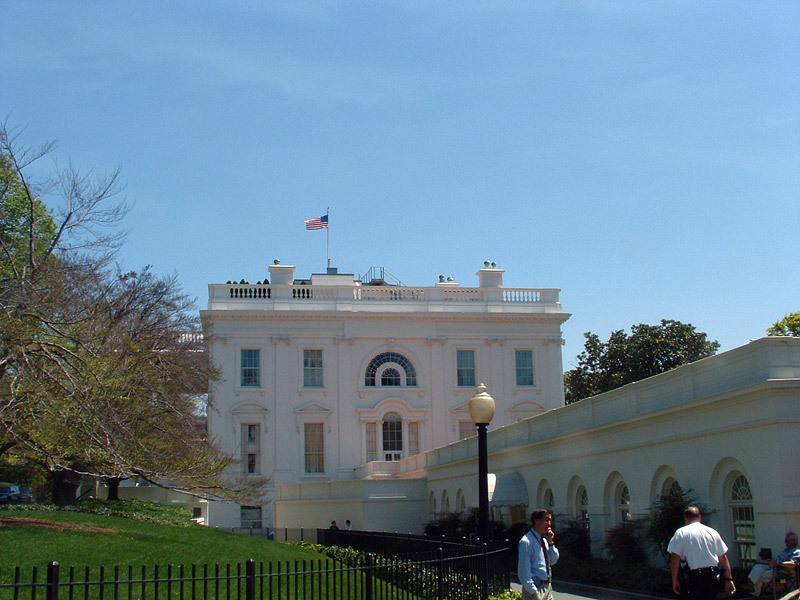 View of the East Wing of the White House. 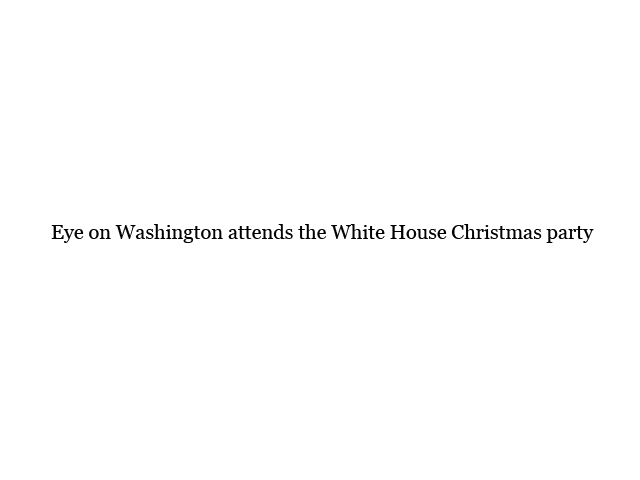 Representatives of a client also attended the West Wing meeting. 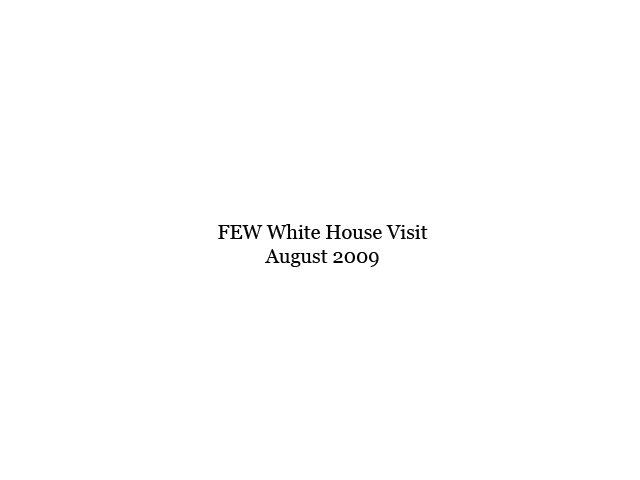 Eye on Washington's President, Janet Kopenhaver, after an August, 2009 meeting in the West Wing. 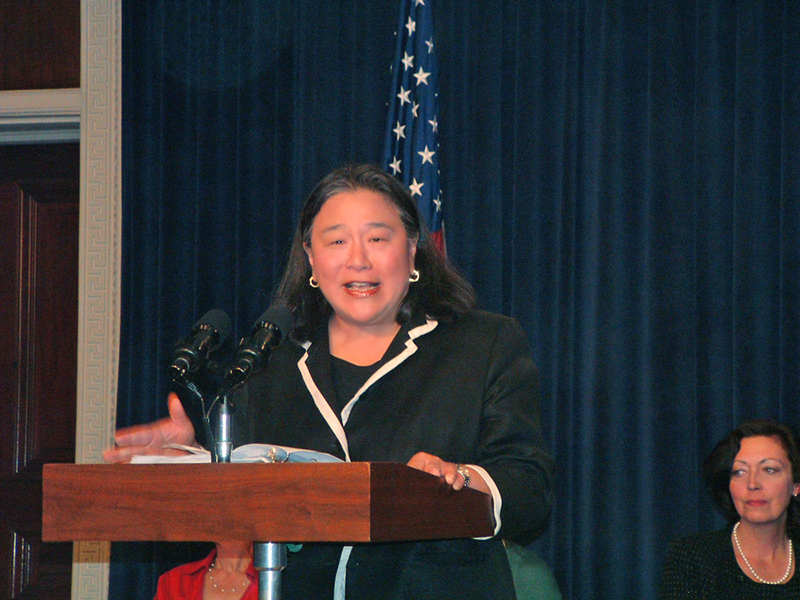 A former client has been instrumental in achieving passage of the Paid Parental Leave Act in the House of Representatives. 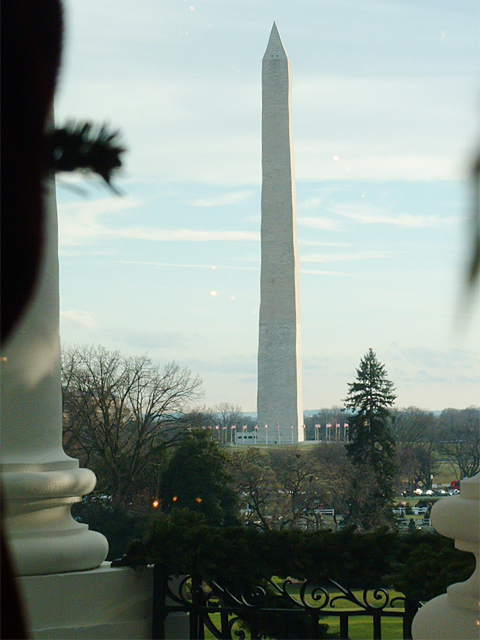 A client was actively involved in obtaining support for the measure through both direct lobbying and a grassroots letter-writing campaign organized and managed by Eye on Washington. 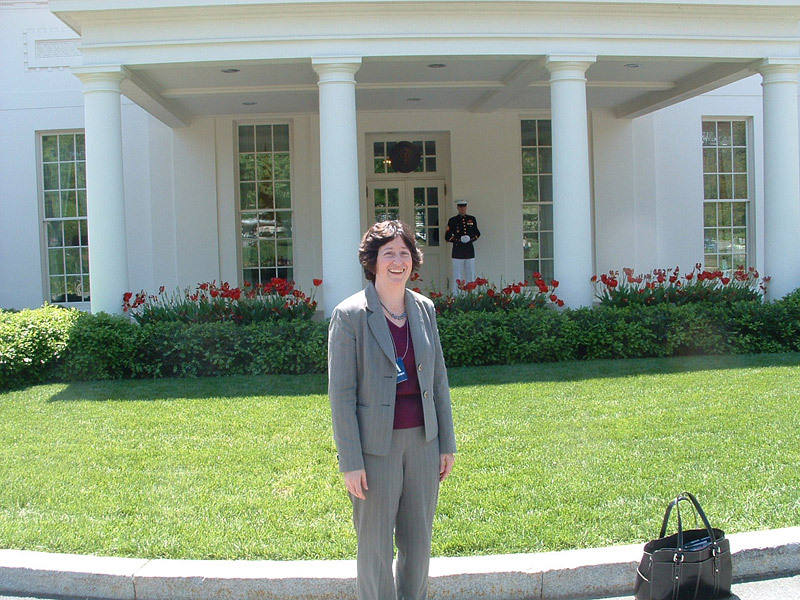 As a result of these proactive efforts, Janet Kopenhaver received a personalized letter of thanks from Paid Parental Leave Act sponsor Rep. Carolyn Maloney and was a participant in a recent press conference held in the Capitol immediately preceding the vote. 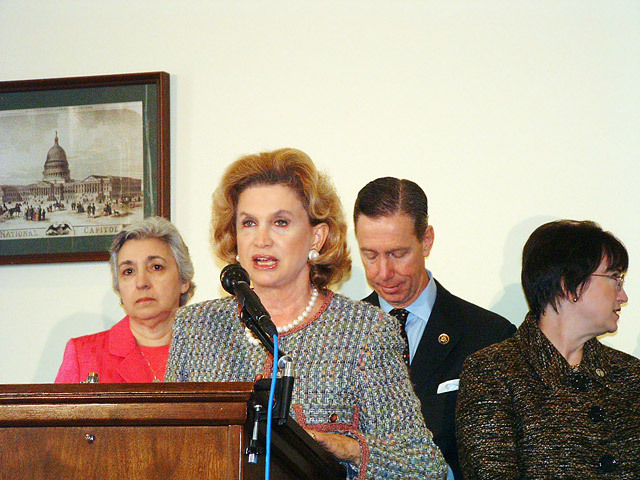 Rep. Carolyn Maloney (D-NY), the sponsor of the Paid Parental Leave bill. 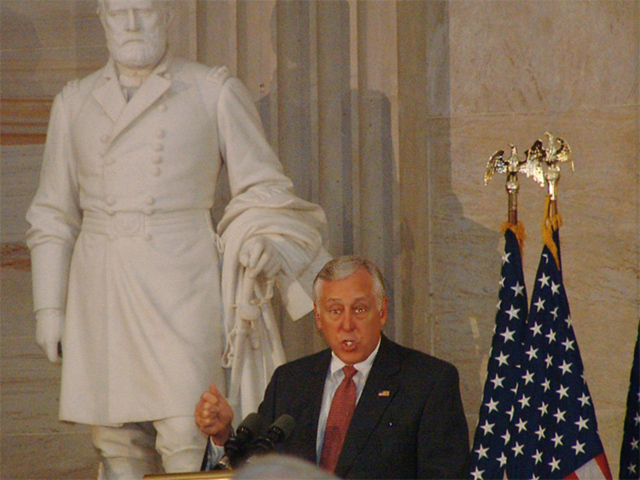 House Majority Leader Steny Hoyer (D-MD). 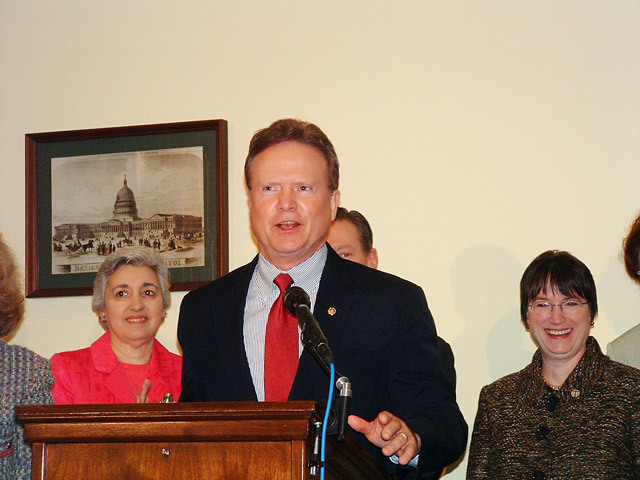 Sen. Jim Webb (D-VA), the sponsor of the Paid Parental Leave Act in the Senate. 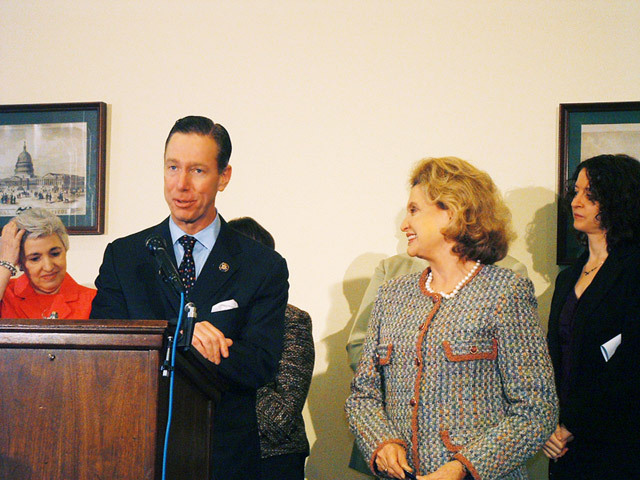 House Federal Workforce Subcommittee Chairman Stephen Lynch (D-MA). 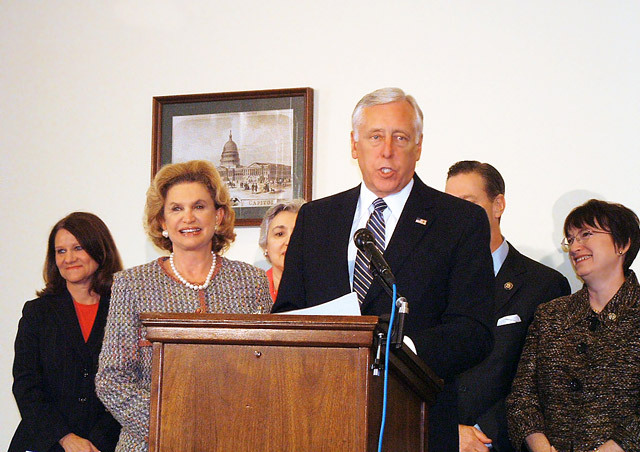 Congressional leaders of the Paid Parental Leave bill legislation. 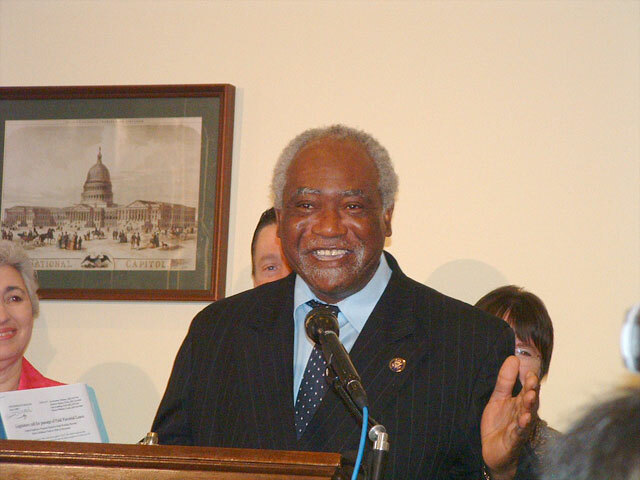 Federal Workforce Subcommittee Chairman (and big supporter of federal workers) Rep. Danny Davis (D-IL).